Meet Hazel, Tyler and Mackenzie Perkins. Tyler is a former Navy flight engineer and Law Enforcement officer who fell in love with Fleet Feet while stationed in Chicago. 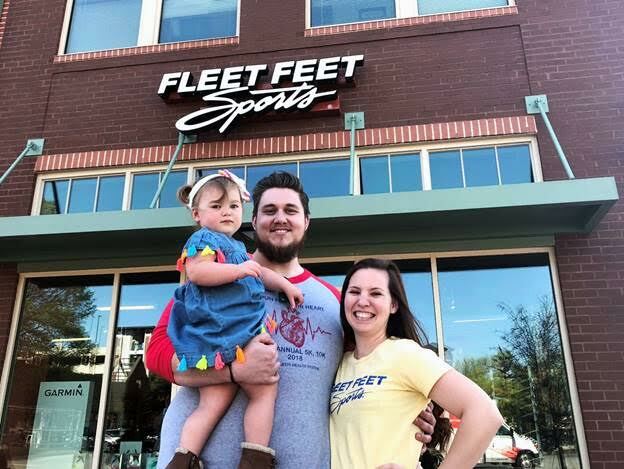 Both Tyler and Mackenzie have worked in Fleet Feet locations in Stuart, Chicago and in North Carolina. Fleet Feet is in the family, Tyler's parents operate the Fleet Feet location in Stuart, Florida. Stop by and just say hi, if your lucky Hazel will be in the store showing folks how to roll out their calves with an Addaday stick!